I could have been a model but instead I went to Uni, became a nurse and now look after sick babies every day! I was contacted last month but the fabulous Beth from Beth's style quest to join in on her monthly link up 'I could be a model but instead...' The idea behind the linkky is that Beth posts a current advertisement picture (like this one from Portmans) and we try and recreate it- showing that all women are beautiful! I love this idea! I could have been a model but instead I decided to keep my short stature and special ability to fall over when I wear heels! hahaha! What a brilliant idea! Olivia, you're definitely as beautiful as any model! wow it's a great idea!! You should play along next month! Thankyou!! Come play along with us!! I feel silly when im being pouty too! The trick is to try and "smile with your eyes" like Tyra says. You look so gorgeous in this picture, girl! What a fun challenge! And you nailed that picture!!! Wow!!! you did an awesome job - right down to the hair blowing in the wind!! you look beautiful and I am glad to know I'm not the only person who finds it hard to be serious/pouty/intense in photos. My natural expression is a big cheesy smile - I find it so hard not to smile in pics! Lol I agree! Cheesey grins all round! And that hair, gargh!!!! This is a really cool idea, I love it. I could be a model but instead ... I'm a Cultural Manager, and I help young people. But ... four years ago I was a model :). A great idea "I could be a model but instead.... " thanks for nice sharing. Your dress is beautiful. You look so pretty! Lol I love comics! I saw Legen of Zelda comics last week! Love the idea behind this and I think you totally nailed the pose! 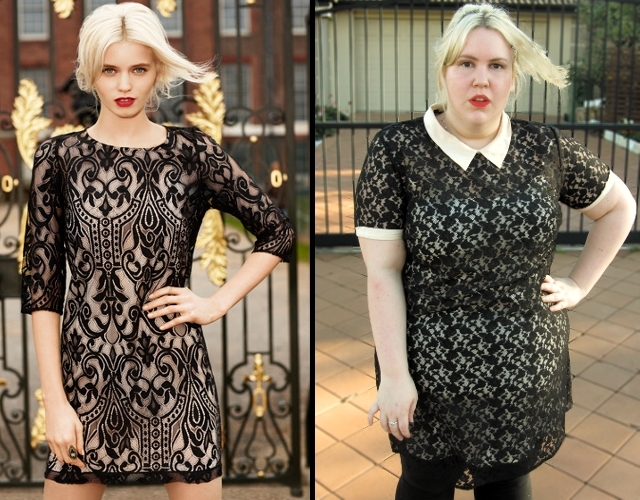 That ASOS dress is adorable! i think you did a fabulous job recreating this look. you look amazing in your lace dress!! Love your dress and the pop of color on your lips...fab! You are more than a model to me, you are UNIQUE and sooooooooooooo gorgeous. Such a great idea! You look fantastic. I am the same, I feel weird pouting and being all serious face, I love a good smile! Oh awwsome!! I'll be checking it out now!!! Hey there supermodel, you got your hair blowing in the wind and everything! I love the dress and lip color you are rocking here. Thankyou!! I don't wear lippy often, but it does rock! You did SO well. Very cool. You look great. OOTD: Goodbye, farewell, I love you!